Even though there's a lot of beer talk here, I tend to shy away from writing beer reviews. I'll mention beers I think are worth trying at a festival or brewery or pub. I'll usually list stats. But I seldom ramble on about any particular beer. I don't read such drivel. Why should you? Value is another issue altogether. If there's something out there that's a great value vs something that isn't worth the cover price, that's information worth passing on. I discovered a couple of examples this past week. I haven't generally been thrilled by Fort George Brewing beers. Admittedly, I haven't tried them all. The 1811 lager is the only one that comes instantly to mind as memorable. 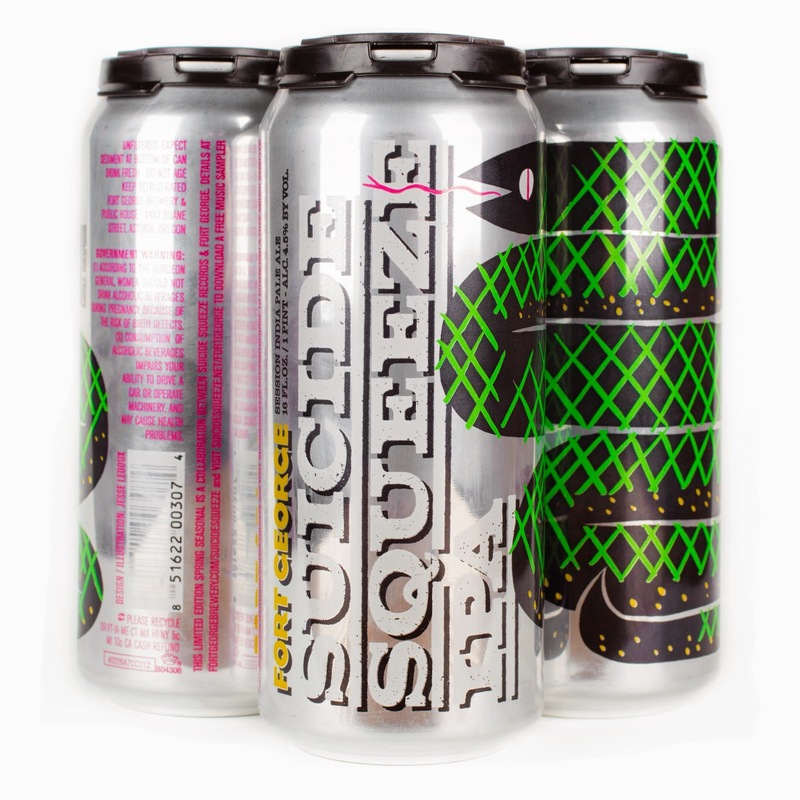 So I didn't have high hopes for Suicide Squeeze IPA, a current seasonal. I figured it for just another hoppy pale ale. I bought a can of Suicide Squeeze at New Seasons the other day. In a glass, the beer has a vibrant orange hue and is slightly cloudy. The aroma is decent, but the real punch is in the deep citrus flavor...Mosaic and Citra hops. At 4.5% ABV, you can drink a few pints of this light-bodied hop bomb without getting floored. Perfect for warm weather...or right now. Just as important, Suicide Squeeze is one of those deals where you're getting great value. At $2.49 for a 16 oz can, you can get a couple of these for the price of a 22 oz bottle of many IPAs. I think I'll be adding it to the list of beers to keep in my fridge for summer. A lot of people were excited when Widmer announced that it was collaborating with Boneyard Brewing on one of their 30th anniversary beers. 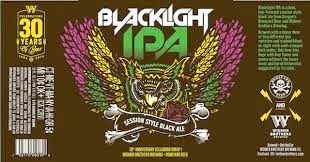 Blacklight IPA, the first of six collaboration beers to be released this year, appeared in early April. This is a collaboration that makes a lot of sense. Widmer derives some PR benefit by connecting with the darling of Oregon's craft beer scene. Boneyard is so popular they can't keep up with demand for their beer. Hooking up with them is good for Widmer's image...makes them look like cool Slayer kids. Boneyard benefits by associating itself with one of Oregon's founding breweries...one that also happens to have available tank space and deep brewing knowhow. It also gets packaged beer into retail stores for the first time. That's great exposure as they prepare to expand production and, just maybe, start bottling or canning on their own. I had Blacklight the other night at Belmont Station. It's all Boneyard in the nose, brilliantly dry-hopped and fragrant....exactly what you would expect. Then the bottom falls out in a finish that's flat as a pancake. Blacklight packs 4.2% ABV. It's dark, but not malty. I loved the aroma and was disappointed after that. Just to be clear, Blacklight isn't a bad beer. It's a sessionable black ale with a great aroma. Some people like that. The problem is the price. Bombers of this stuff are $8.49 at New Seasons. Seriously? It's a fancy bottle and all, and I realize production and distribution are limited. But this is a ridiculously overpriced beer. Widmer has some expertise in this area. Their reserve series beers are pricey. Last year, they collaborated with Cigar City Brewing on the barrel-aged Gentlemen's Club series. Those beers were expensive and didn't move all that well. Many retailers who still have bottles have resorted to discounting to get rid of them. Not the best. There's another one of these collaboration beers coming in May. This time, Widmer is teaming up with Breakside, another of the hottest brands going in these parts. I suspect the beer will be fine. Price is another matter. If it's another light style in the vein of Blacklight, the price ought to be in the $4 to $6 range. Otherwise, it's probably not a very good value. As a kid, I sometimes bought cheap junk that disintegrated in short order. My dad would say, "You get what you pay for." There's some truth to that adage even with craft beer. Cheaper isn't always or even usually better. But value is value. And paying too much for any beer will get you buyer's remorse. I was super-excited about the Cigar City collaboration since it was my first chance to try Cigar City. Too bad it was so disappointing. I get that Widmer has been around a long time, they make a couple of decent beers, and they're good people, so I hate to dis them...but I have not been impressed with ANY of their collaborations, especially for the price. I just don't bother with them anymore, sadly. There are just too many other great beers out there. A ridiculously overpriced beer in a category that prides itself on not getting you intoxicated after drinking 3-4. Lame.